The U.S. Department of Labor’s Occupational Safety and Health Administration recently conducted an inspection of a Florida-based Macy’s location and issued 14 citations to both Macy’s and The Finish Line for numerous safety and health violations. The most recent inspection, conducted on Jan. 15, 2016, in Aventura, Florida, came as a result of a complaint, filed in relation to several workplace injuries. OSHA determined that the Macy’s and Finish Line workplaces were hazardous, due to violations involving obstructed exits and electrical wiring. Macy’s Inc., a multi-national retailer based in Ohio, has undergone inspection by OSHA over 40 times and has repeatedly been cited for similar violations, involving obstructed exits, obstructed access to electrical disconnect panels, and the use of flexible cords instead of permanent wiring, at different locations. The Finish Line, an Indiana-based company, was located within the Macy’s store and shared the burden of a joint inspection. The proposed penalty to Macy’s and The Finish Line totaled $103,220. 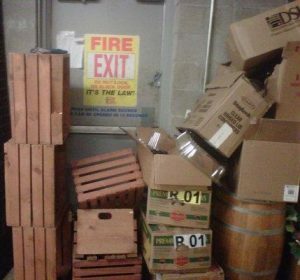 OSHA cited Macy’s for three “other-than-serious” violations for a lack of exit route signs, not providing signs on non-exit doors, and failing to mount and identify the location of fire extinguishers. The Finish Line was issued one “other-than-serious” citation for failing to mount fire extinguishers. Many violations are easily identifiable and preventable. OSHA-approved general industry courses are a recommended measure of training for employers and employees. Electrical safety is a crucial part of OSHA compliance. The 2015 revision of NFPA 70E requires employers to conduct an arc flash risk assessment. If risks exist, employers must establish safety protocols to protect employees from electrical hazards. With proper arc flash analysis training, employees can conduct hazardous electrical work safely. Arc flash occurs when a burst of energy escapes due to an arc fault. With enough air to conduct the arc and electrical equipment operating at 120 volts or more, an arc flash can appear as an electrical fireball. After the first flash, the resulting plasma conducts all available energy and releases a massive explosion that can severely burn everything in its path and send shrapnel flying at lethal speeds. In industrial and manufacturing settings with inadequate safety procedures and training, safety may take a backseat to productivity. Workers removing equipment covers and opening doors, greatly increases the risk of electrical burns and arc flash accidents. Equipment may not be shut down properly, and may be operated without sufficient safety protocols. It only takes one faulty component or safety oversight to cause a devastating arc flash that can severely injure or kill nearby workers and destroy equipment in the blast radius. 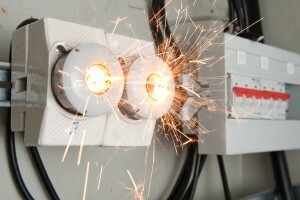 There are several ways to protect employees from arc flashes and other electrical risks. 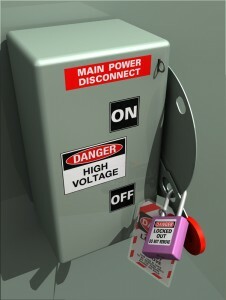 The most effective method is to de-energize all circuits to create an electrically safe work environment. Safe work practices outlining proper equipment use and maintenance and risk assessment are crucial. Employees should wear insulated clothing, proper PPE and use insulated tools. Consider installing electrical barricades to help shield employees in the event of an explosion. de-energization would make the workplace more hazardous. de-energization exceeds the limits of equipment or operations. Equipment and circuits operate at less than 50 volts and produce no risk of explosion or electrical burns. All equipment is installed according to industry guidelines and maintained regularly, all doors securely closed, all covers firmly secured, and no warning signs of failure exist, e.g. damage, loose components, strange noises, etc. All employees should review the employer’s written safety procedures and receive a job briefing prior to working on energized systems. They must also carry an energized electrical work permit, use properly insulated tools, and wear the appropriate personal protective equipment (PPE) as determined by the results of an arc flash risk assessment. It is vital that employees receive comprehensive electrical safety training. Conduct an arc flash risk assessment and other task analyses to evaluate the level of electrical risk in the workplace. The findings can help you address areas of improvement, design new safety protocols, and focus on training points for employees. When all managers and employees are well-versed in electrical safety, the risk of arc flashes drops dramatically. No matter the industry, worker safety should be a company’s top priority. Recently, Formed Fiber Technologies, LLC landed in hot water with the U.S. Labor Department’s Occupational Safety and Health Administration. The auto supply company, which manufactures fibers and fabrics for use in vehicles, submitted fraudulent documents and made false statements claiming they had corrected previous safety citations regarding their hydraulic presses. The company now faces over a dozen safety citations and over $800,000 in fines. According to OSHA, the Sidney, Ohio manufacturing plant, whose clients include General Motors and Toyota, racked up multiple safety infractions for knowingly and willfully exposing workers to energy-related hazards, including amputations. Failure to protect employees from hazardous machinery ranks among the most common OSHA violations. Workers injured by such machines often suffer severe, life-changing injuries or even death. OSHA Lock Out/Tag Out regulations provide standards and procedures that, if properly understood, implemented and carried out, protect workers from these dangerous situations and protect employers from the fines and other consequences of violations. Such a situation can only occur in an atmosphere of management disregard for and worker lack of knowledge of proper LOTO procedures. Had the workers known about proper safeguarding and undergone lockout/tagout training, the story would likely have been very different. It’s crucial that company executives, board members, managers, and workers become well-versed in safety practices. Proper lock out/tag out (LOTO) procedures go a long way to protect workers from accidents when operating any type of machinery. LOTO revolves around safely deactivating or disabling machinery to stop the release of harmful energy. Any business that works with energized equipment must recognize the risks and take comprehensive measures to maximize worker safety. The employer is responsible to protect employees from hazardous energy, both while machinery is in operation and while it is being serviced. While types of machinery and workplace environments vary widely, the most common LOTO safeguard is a Lockout or Tagout device affixed to the equipment that prevents its operation from occurring. Every worker must understand and be able to practice safe LOTO procedures. By teaching workers how to apply and operate energy control mechanisms, companies can make the work environment safer and reduce on-the-job injuries. Workers should know what to do when machines are marked with a lock or tag. Safety training is key to increasing knowledge and awareness among employees and making sure that there is a culture of safety throughout the workplace. Workers must practice LOTO principles daily, monitor one another’s progress, and participate in retraining courses to enhance their knowledge and skills. Only through collaboration and a shared commitment to safety can managers and workers maximize safety and avoid making the same mistakes as Formed Fiber Technologies. Be sure to check back soon for informative and helpful information on this blog. We will be posting here soon. Thanks!